Everyone knows of Volvo, right? One of Sweden's most famous brands, known for safe quality cars. Some decades ago, the car making part of Volvo was sold off and is now in the hands of a Chinese company. This week, August 27, Volvo Cars introduced an updated version of its logo. It was created by Stockholm Design Lab who name Trollbäck + Company as a project partner. The new version of the "ironmark" – as the mark is called – has been simplified to its purest form with an uninterrupted iron symbol, optimised for all environments. The simple form is said to embody Volvo's brand vision; "to be the world's most progressive and desirable car brand". It was introduced to celebrate a new line of cars. The first model in the line is called XC90 as will also be the first to feature the updated logo. The European Games is a new multisport event that is planned to be held quadrennially as a sort of "European Olympics". 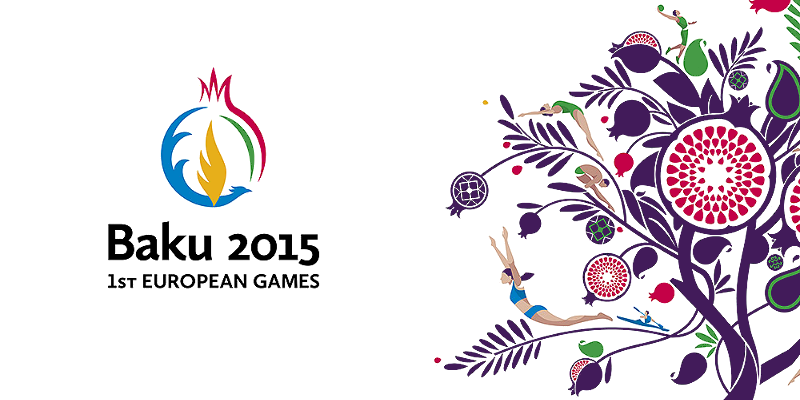 The first European Games have been awarded to Baku in Azerbaijan who will host the first such event next year. Yesterday, the organising committee unveiled the look of the games, created by SomeOne in London. The games' logo was unveiled about a year ago, what was revealed yesterday is the imagery, pictograms and other graphic design elements that will constitute a full identity programme. It takes its inspiration from the nature of Azerbaijan and at its core is a colourful image of a pomegranate tree. The British Horseracing Authority is the governing body for horseracing in the United Kingdom. Last month, it launched a new corporate identity, created by Firedog Creative. The old logo was outdated, awkward and poorly executed, so it had to be scrapped. Firedog intended for its replacement to work better in digital environments by allowing the symbol to be used without the wordmark, which wouldn't have been possible with the old logo. They opted to use the three-letter acronym for stonger visual impact and a red-white-and-blue colour scheme to reinforce British values. The View is a long-running daytime chat show in the United States on the ABC network. Based around a panel of four women discussing topics of the day, the format has been spawned numerous imitations in the US and around the world. In September, the show will relaunch with a new studio and new co-hosts. Ahead of this, the show revealed a new logo last week. This is reportedly the first time the show changes its logo since it came on the air 1997. Tatts Group is a major Australian lottery and gambling company, operating many forms of significant lotteries and other gambling services and now growing internationally. Yesterday it launched a new corporate identity, developed by Hulsbosch. The new identity aims to emphasise Tatts Group's global reach with a new and more universal star symbol. The new corporate identity launched this week and the plan is to launch new identities for lotteries and wagering services at a later date. NPO is the centralised organisation responsible for coordinating the activities of public broadcasters in the Netherlands. Public broadcasting in the Netherlands has traditionally been split between several organisations but has over time had to consolidate in the face of increasing competition and budget cuts. Recently, the organisation has worked united all public broadcasting activities under one brand. They feel that they need to present a unified identity with a single brand for the public to find their programming in the digital age. The final step was taken yesterday, August 19, when the main channels were renamed to include the NPO name. Previously, the main TV channels where known as Nederland 1, Nederland 2 and Nederland 3. They are now called NPO 1, NPO 2 and NPO 3. The radio networks have had an NPO tag added to the beginning of their names. This change has been in the works for some time and the namechanges were announced last year when the NPO also introduced a new logo. NPO's smaller digital channels adopted their new names earlier this year. For the TV channels, the old logos have simply been amended to include the NPO logo. Existing graphics packages have been updated to include the new logos. The radio logos have been given a new and more monolithic appearance, replacing a set of more varied logos. July, summertime in the northern hemisphere with relatively few new logos. Yet, you wouldn't know that for all the logo chatter that various media filled out their slow newsdays with. In particular there where two new logos for web sites that caused uproar, even leading the Guardian to claim that the logos had misfired. What was so wrong with the new logos for Airbnb and Foursquare remains unclear. Oh well. Ding is a mobile telecommunications service aimed at people who want to communicate with friends and family in other countries, allowing people to send so called "top-up" credits to be used for talk, text and data on their mobile phones. Since its foundation it has expanded to 110 countries, working with 300 mobile operators and one million costumers. It was marketed as Ezetop until the beginning of July when it relaunched as Ding* with a new brand identity developed by DixonBaxi. The name and the asterisk allude to the arrival if a top-up credit. Overall, the brand identity wants to communicate simplicity simplicity and speed. Sudiksha Knowledge Solutions is a social business that was founded to bring quality education to low-income children in India, focused on developing cognitive skills and language arts among pre-schoolers. It recently adopted a new visual identity, developed by Siegel+Gale. The new identity intends to reflect "joy and beauty of learning" with several new and redesigned graphic elements and an effort to standardise the graphic expression everywhere. SBT is one Brazil's leading television networks, founded in 1981 as Sistema Brasileiro de Televisão. Since the beginning, its logo has been its initials in a circle, very much reminiscent of Paul Rand's ABC logo. Brazilian TV design has long been very shiny and colourful, and SBT has followed suit. However, this is about to change as the network unveiled a new logo a month ago that is much flatter than its predecessors. It was developed by Publicis Brasil and SBT's in-house designers. The new logo is made up of various overlapping coloured ellipses, symbolising "agility, modernity and the constant process of evolution". Landshypotek Bank is a Swedish cooperative building society, founded in 1836 and owned by its members. Last year it transformed itself into a bank in February this year it launched a new visual identity, created by design agency Stockholm Design Lab. The old wheat spike symbol was discarded and replaced by a silhouette of a tiny boy on a flying goose, taken from the classic Swedish novel The Wonderful Adventures of Nils about a rude boy who gets shrunk and flies across the country. It brings connotations to farming and the Swedish countryside. The colour scheme is inspired by nature and the imagery makes further references to the countryside. SABC3 is the third TV channel of the South African Broadcasting Corporation. This week, the channel launched a new look with a new logo consisting of a number three partially obscured by another number three in a square. On screen, the logo animates as a spinning cube in an environment dominated by bright pastel colours. The SABC has apparently not published anything about its new logo which means most reporting about it focuses on the now standard social media backlash. The newspaper business is in trouble and the Tribune Company, one of the largest newspaper publishers in the United States, recently spun off its newspaper division, including the Chicago Tribune which gave the company its name. The remaining company retains its assets in broadcasting, TV production and digital media. This week, on August 4, its was announced that the company would change adopt the name Tribune Media Company. The logo above came with the announcement. No design credit was given. The singing spectacle known as Eurovision Song Contest is the largest television event in Europe, held every year since 1956. In an effort to maintain continuity between different contests, its organisers introduced a generic logo in 2004 to be used by all future contests. While there may have been some merit in giving the contest a consistent logo, the chosen design used freeform brush letters and had several flaws. To remedy this, Eurovision revealed a redesigned version of this logo last week. The work was done at Amsterdam-based Cityzen Agency by a team lead by Cornelis Jacobs. Taking an evolutionary approach, the redesign maintains a handwritten wordmark and the heart motifs and places its focus on technical aspects such as legibility. The new letterforms are smoother (the old ones required about 5800 vector points just for the Eurovision wordmark) and have been rearranged. The typeface for "Song Contest" was changed from dusty old Eurostile to the ubiquitous Gotham. Bayerische Landeszentrale für neue Medien (roughly meaning "Bavarian State Authority for New Media") is a government agency in the state of Bavaria, responsible for licensing and regulating broadcasters and others kinds of media. A month ago, on July 7, it launched a new visual identity, developed by Augsburg-based agency Mellon Design. The new look is designed to be "modern, airy, clear, dynamic and user-friendly". It maintains BLM's compass symbol, reflecting its function as a regulator. It and the letters in the name have been given rounded corners to appear more dynamic.